Try the rub from the team that won the 2009 American Royal Invitational. From the team of Todd Johns and his brother-in-law Randy Hinck (who compete as the Pork Pullin Plowboys) who bested 123 past grand champions to capture the overall crown. 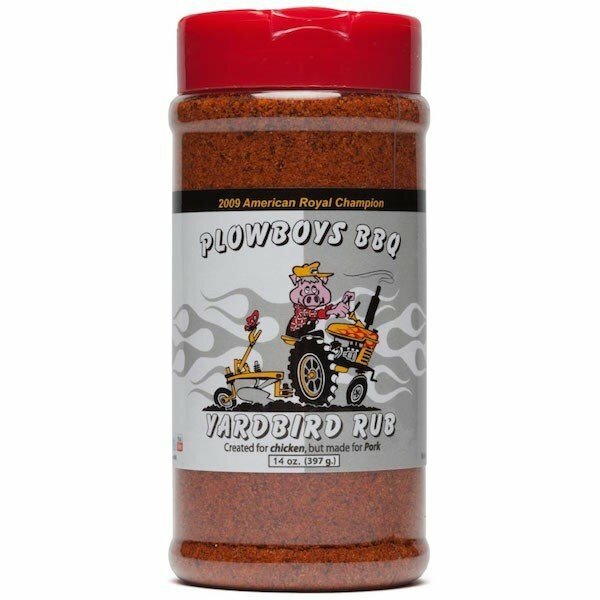 Plowboys Yardbird Rub was developed for competition bbq but for those of us that are just backyard bbq geeks it gives us the opportunity to produce award winning bbq without the competition. The savory rub, with a touch of sweetness is followed on the back of the tongue with just a little heat. Sprinkle your chicken or pork with this rub and watch them come back for more! The bottle reads, "Created for chicken, but made for pork" and after trying this rub on some pork chops, we agree!